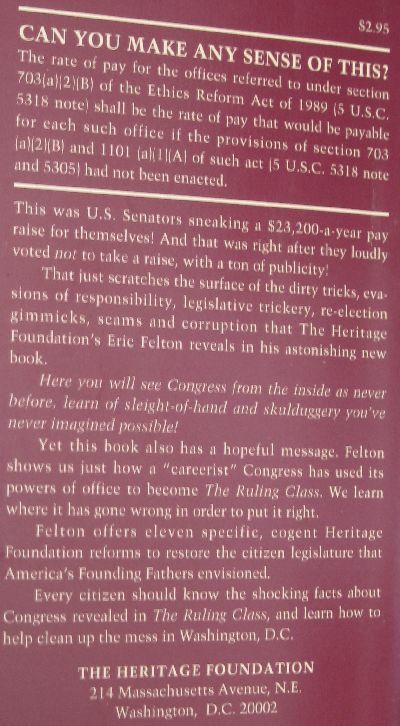 Congressmen and their "Constituent services"
"The Ruling Class Inside the Imperial Congress"
The book pretty much explains and gives details on how the United States Congress is corrupt to the core and how it serves it members, rather then the people of the United States. 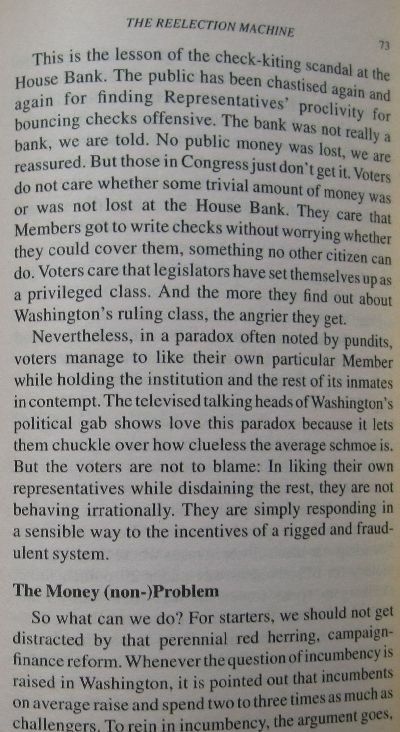 "Congress is corrupt and only serves the interests of its members, and certainly not the people it pretends to represent"
The book points out that 5 to 10 percent of an incumbents vote total can be attributed to gratitude for "constituent services". "Constituent services" is the part of a Congressman's office that helps people or "constituents" in the Congressman's district solve problems they are having with the government. You know problems like when the Social Security office tells a person that the SS office records shows that the person is dead. So smart people who don't want to deal with the government idiots in the Social Security office write their Congressman, and the Congressman gets his "constituent services" to solve the problem. 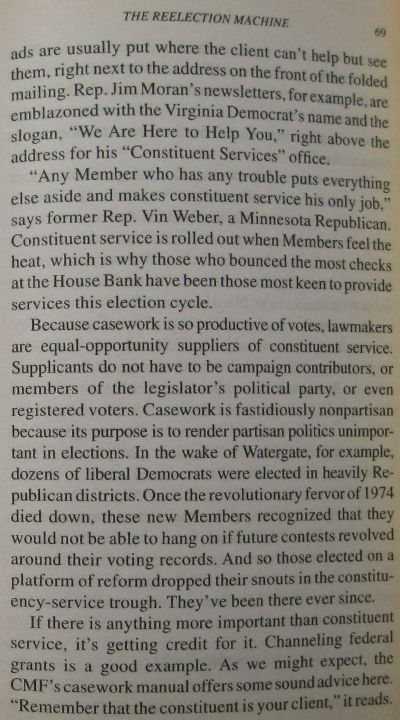 The book says "constituent services" is a primary reelection strategy for most Congressmen. It goes on to say that "constituent services" is a reelection strategy that is even more important then raising cash. 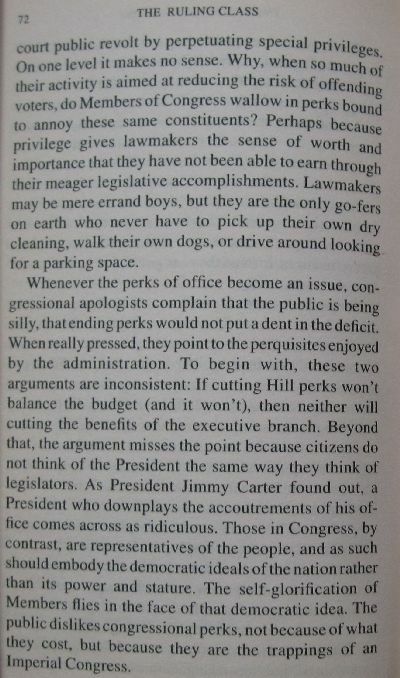 "Constituent services" didn't play a big part in getting Congressmen reelected until the 1930's. Of course that is when the New Deal came along and the Federal government became involved in the lives of a large number of Americans. 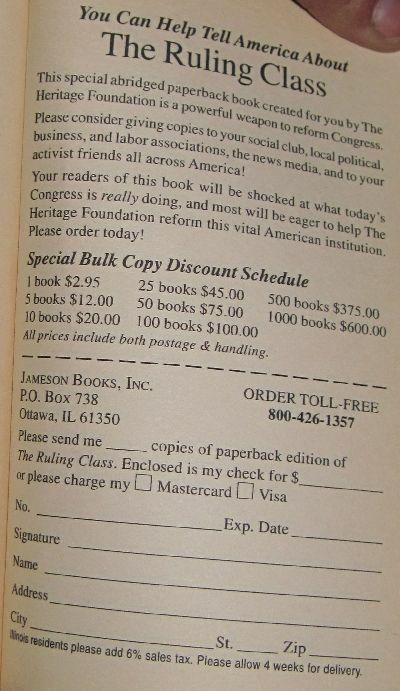 Before that American rarely wrote their Congressmen. 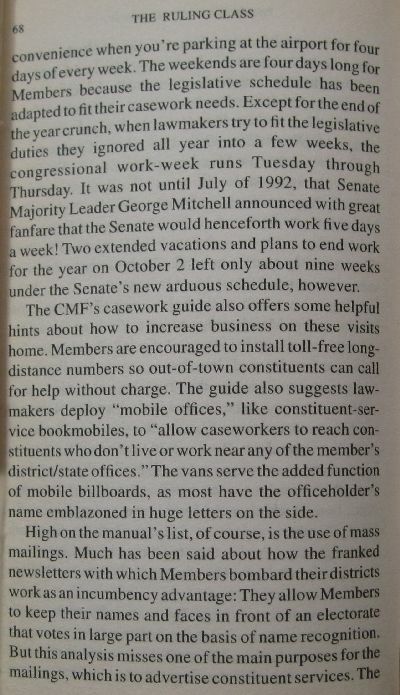 The book says that half to two thirds of a congressman's staff is engaged in "constituent services". Of course each of these "constituent services" staff members amounts to a full time campaign worker who's salary is paid by the taxpayers. 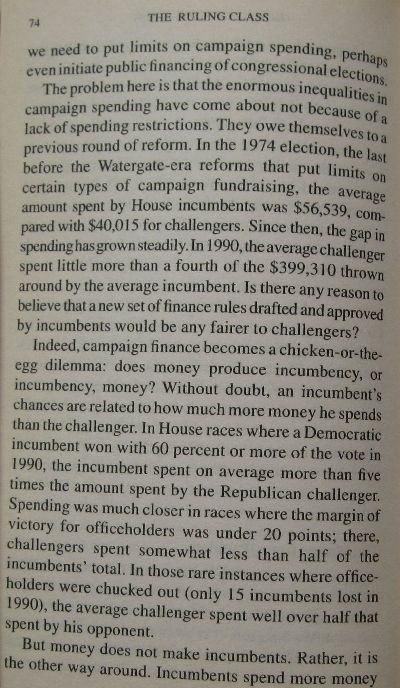 No wonder incumbents have an edge in getting reelected. 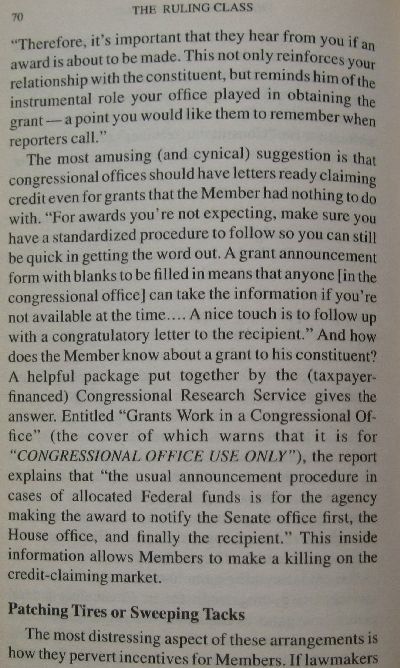 The book says the only thing more important than providing "constituent services" is getting credit for it. Of course that is the name of the game - to get the Congressman reelected. 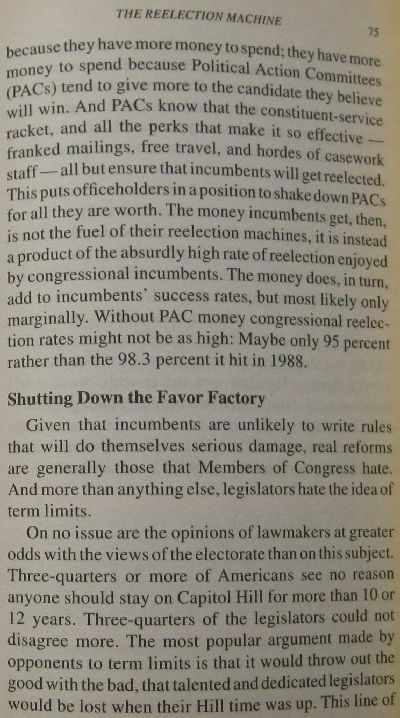 The book jokingly says that Congressmen can intentionally screw up things to help themselves get reelected with higher margins. 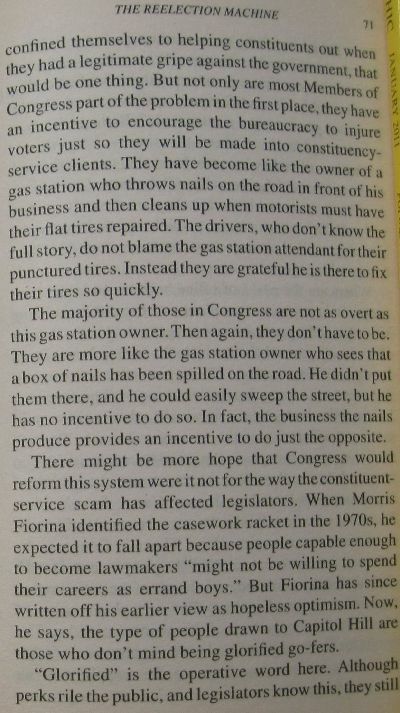 It gives an example of how a Congressman spreads nails on a highway to cause his constituents to get flats on their car tires. Of course the constituents doesn't know their Congressman cause their flat tires, but the constituents are certainly happy when the Congressman fixes their flat tires for free. And of course they routinely vote to reelect the jerk.